Imagine your kitchen cabinets completely organized. You know where everything is and you don’t cringe with embarrassment when opening messy cabinets in front of guests, instead you grin with pride. Besides the basics, there are loads of other tips and tricks that can help you turn your cabinets into the organized boxes they were intended to be. Remember, it’s not about creating cabinets that are picture-perfect and ready for a magazine shoot, instead it’s about creating organized cabinets that work best for you. Oh—and don’t forget to take your ‘before’ pictures, because after using these 9 tips and tricks your cabinets are sure to look and function far differently. When undertaking the task of reorganizing kitchen cabinets it can be tempting to try and do it all at once. This sort of mentality will only prolong the time it takes for you to get started. Or, you will end up halfway through the project and out of time, forced to leave piles of stuff everywhere. Start small, with one shelf or section at a time, so that you can begin organizing your cabinets right away, even if you only have a few minutes to spare. As you organize spaces you will have to move items around in exchange for similar things, don’t worry so much about where you put these things. It’s more important to get one section just right. Later, when you continue organizing you will find a home for these other items. When things look nice you are naturally more motivated to maintain this appearance. Reorganizing your cabinets grants you the perfect opportunity to clean up a little. Wipe down cabinets on the inside, and keep the sink half-full of warm, soapy water so that you can soak anything that looks dusty or dirty as you clean out the cabinets. This is also the time to check dates and get rid of old, spoiled food. Make one box for trash and one box for give-away, as you will likely find old appliances and utensils you don’t need to store any longer. Anything that is broken and has not yet been fixed, are you really ever going to fix it? Anything you haven’t used in the last 1-2 years and you can’t see yourself using in the foreseeable future. Think back over the last week, what have you spent time doing in the kitchen? What utensils or cooking ingredients did you access most frequently? Identifying the components of your kitchen that are most important to you will help you decide on the best way to organize your cabinets. Keep your most important items easy to access. The things you use less often can be placed higher up or behind more fundamental items. Since you only have X amount of cabinet space, you want to make sure that your most frequently used possessions have a space in the cabinets before finding a space to store your turkey roasting pan you use once a year. If you find there is no room left for rarely used items, you can always store them elsewhere and retrieve when needed. 4. Does That Really Belong In The Kitchen? 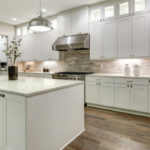 More than likely there are things clogging up your kitchen cabinets that don’t belong in the kitchen; it is time to find a new and more appropriate home for them. It’s hard to keep your kitchen organized when your cabinets are jammed with old mail, a stapler and whatever other odds and ends have gotten tucked away here over the years. By getting ready of unnecessary clutter you will find new spaces to fit what really does belong in the kitchen. 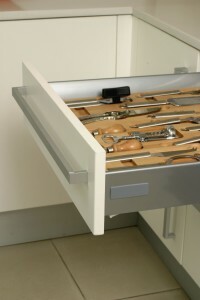 Shelf organizers for cabinets are incredibly handy for saving space. They allow you to stack far more dishes within your cabinets in an organized fashion, as they decrease the amount of air space wasted in typical box cabinets. You don’t have to store your small bowls inside of the big bowls, which just creates an annoyance when you try to access the bigger bowls. With a shelf organizer you will have enough room to put all of your dishes on their own designated shelf. You can find nifty shelf organizers online or at a number of stores for under $20. When organizing your kitchen cabinets place items near where they will be used. For instance, store your measuring cups, knives, cutting boards and other prep tools near the space you use to prep food, chop vegetables and season your meats. Another zone you’ll need is your cooking zone, the place where you actually create heat and get food steaming. This location is usually near the stove, microwave and oven. In your cooking zone you want to store pots, pans potholders, bake ware, cooking utensils and everything else you need to access when cooking food. 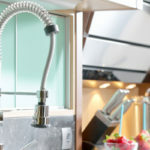 Dishes and dishwashing is another zone near cabinetry that should be equipped with like-supplies, such as dish soap, sponges, and paper towels. Want to know one of the biggest troublemakers when it comes to kitchen storage space? The number one culprit is often plastic and glass food storage containers, better known as Tupperware. Tupperware containers frustrate people, myself included. Tupperware is difficult to contain in a small space, and when your cabinet shelving is limited you need a solution. The first step is to take out all of your Tupperware and see what you really have buried in your cabinets. Match up the winners and seek out the single lids and containers that can be tossed out or repurposed. Once you have your best Tupperware left, you can nest the smaller containers within the larger containers to save space. Keep the lids tucked away elsewhere, as they tend to flop around cabinets and make a mess. Tupperware, as well as water bottles, can also be placed in storage hung over the back of the pantry door. Something as simple as a behind the door shoe rack can serve as a great place to store a number of problem items that tend to spread out and take up a lot of space. You might think you are using up every inch of space available for kitchen storage, but chances are you missed a few key locations. For instance, a great place to store spice containers is in a rack attached to the inside of a cabinet door. This allows you to free up cabinet space as well as keep bulky spice racks from hogging up valuable counter top space. Simply conducting an online search for “spice rack cabinet door” will produce countless images and options for you to consider. Wall space can also serve as a great place to store things, such as knives, dishtowels, or pretty dishes. You can install DIY shelving of unlimited assortment depending upon the type of item(s) you need to store. A junk drawer is supposed to contain random odds and ends that are pulled out and used every so often, like hair ties, push pins, or rubber bands. If the junk drawer becomes overrun with real ‘junk,’ things go in and never come out, your junk drawer needs some serious de-cluttering. Sorting through your junk drawer can create a new world of space. Your Kitchen Cabinets Are Organized…. Now How Do You Keep Them Organized? Take before and after photos. 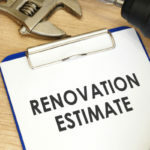 Take a good look at the before and after photos of your kitchen, by seeing the huge difference your efforts have made you will be more motivated to keep things looking great. Share photos with friends and family on social media. If you enjoy using social media share photos of your hard work. As people like and comment on your cabinet transformation photos, you will be more motivated to maintain this level of organization. Loved ones and friends may even come to you for advice on how they can organize their own cabinets after seeing how well you have mastered your own. Make it a rule that everything must be put back in its place, always. You can’t be the only one striving to keep the cabinets organized. Roommates, family members, or whomever you live with must be in on it too. Make it a clear rule that everything has a designated space and must be put back accordingly. When everyone chips in it’s a lot easier to maintain organized cabinets. Everything must have its own designated space. When you organized your cabinets you created a space for everything. Now the challenge is to stick with the designated locations and continue to put things back where they belong. Once you start misplacing things, the mess doesn’t stop. Reassess when needed. If a particular item never ends up in the right place, or one section of your cabinets is still turning into a mess it’s time to reassess your current system. Perhaps there is a better alternative to your current storage method that will tidy up this aspect of your kitchen. 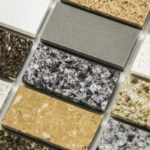 Tops Kitchen Cabinets can help you further organize your kitchen with affordable kitchen cabinets, countertops and more!